No. 44 (Royal Marine) Commando was a battalion size formation in the British Commandos, formed during the Second World War. 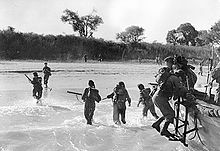 The Commando was assigned to the 3rd Special Service Brigade and served in the Burma Campaign. 1 2 "No. 1 Army Commando history". Commando Veterans Association. Retrieved 3 May 2010.
van der Bijl, Nick (2006). No. 10 Inter-Allied Commando 1942-45. Osprey Publishing. ISBN 1-84176-999-1. Chappell, Mike (1996). Army Commandos 1940-45. Osprey Publishing. ISBN 1-85532-579-9. Fowler, Will (2009). Royal Marine Commando 1950-82: From Korea to the Falklands. Osprey Publishing. ISBN 1-84603-372-1. Haining, Peter (2006). The banzai hunters: the forgotten armada of little ships that defeated the Japanese, 1944-45. Robson. ISBN 1-86105-941-8. Tomblin, Barbara (2004). With utmost spirit: Allied naval operations in the Mediterranean, 1942-1945. University Press of Kentucky. ISBN 0-8131-2338-0.